Publisher’s Note: My moniker on the Internet is planetgazer for reasons that should be obvious to my readers by now but I could have just as easily chosen moongazer. Well, moongazer, if you’re out there, I’ll be with you in spirit this week. First-quarter Moon. The half-lit Moon is quite close to Mars as seen from North America. The Moon occults (hides) Mars during daylight for Hawaii and at dusk or night in parts of Latin America. Now the waxing gibbous Moon shines closely under Saturn in the evening (for North America), as shown at right. 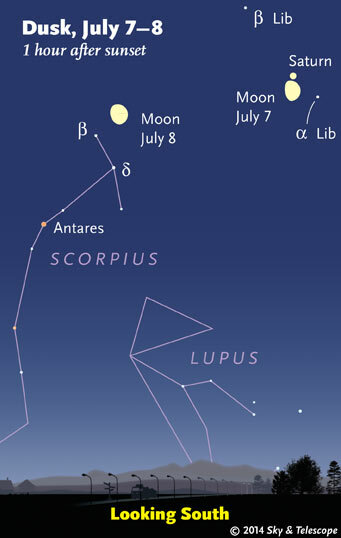 For southern South America, the Moon occults Saturn. This entry was posted in sky watching, WHAT is That?, What's New? 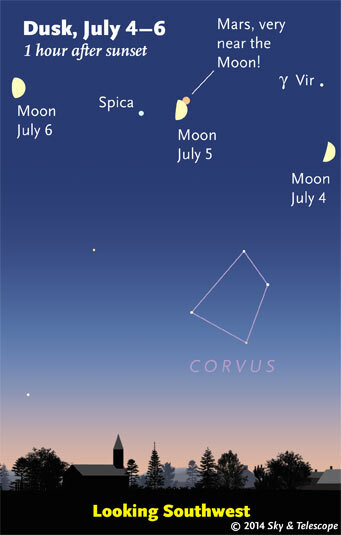 and tagged moon passes near Mars and Saturn, skywatching on July 4, 2014 by Stewart Dale Spencer. Wasn’t Moongazer one of the apes in 2001? Well whadaya know? Evidently, he was the one learned about tools from the alien obelisk and then decided to use a tool to bash the head of an ape from another tribe of apes.